Adults aren’t eating enough fiber. Considering that fiber could play a key role in reducing the aging of the brain, you may want to add more beans to your lunch. Throughout life, you were likely told to eat a fiber-rich diet. Not only does it do wonders for constipation, but it actually has a hefty role in your overall health as well. It can help you maintain a healthy weight, reduce the risk of developing diabetes, and decrease the chances of developing heart disease. For your bowel health, a fiber-rich diet is unquestioned. It helps lower the chances of developing hemorrhoids and has been noted to ferment in your colon at times. This helps your colon remain healthy and might work to keep it from acquiring diseases. It also helps to lower your risk of acquiring small pouches in your colon. Regarding your heart health, a fiber-rich diet works to reduce the bad cholesterol in your blood. It does this by lowering the amount of low-density lipoproteins that are taking up room inside of your blood. It has also been shown to reduce your blood pressure and keep inflammation from forming. 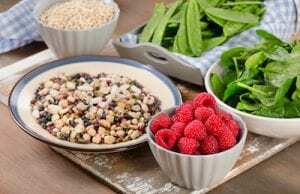 Another aspect of a fiber-rich diet that you may not have considered before is its role in weight management. Because it makes you feel fuller, you actually end up eating less when you consume foods rich with a fiber-rich diet. They take longer to eat and are less energy-dense, so you can take in fewer calories. Interestingly enough, the recommended amounts for men and women are incorrect. Doctors, as of right now, recommend that men aged 50 or younger eat 38 grams a day while women should eat 25 grams. Men aged 51 or older, however, are recommended to eat 30 grams, and women are recommended to eat 25 grams. This is backward because a fiber-rich diet has been shown to help reduce the aging of the brain. As such, the older you are, the more you should eat. In a recent study, researchers examined the role a fiber-rich diet plays in the aging process of the brain. Two groups of mice were given different diets: one, a high-fiber diet and the other, a low-fiber diet. They discovered that those that consumed a high-fiber diet reduced inflammation of the brain’s microglia. This part of the brain tends to become super active and inflamed when the brain gets older. In fact, inflammation of the microglia has been shown to be one of the leading causes of memory decline as well as an overall cognitive decline as the brain becomes older. By decreasing the amount of interleukin-1β that is produced in the brain, the fiber-rich diet was able to reduce the amount of inflammation of the microglia. This chemical, interleukin-1β, has actually been linked with Alzheimer’s. 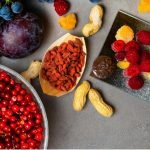 By reducing the amount of it that is produced, a fiber-rich diet can basically keep the area of the brain from becoming inflamed, and as such promote consistent memory improvement. While more research needs to be conducted, for those who suffer from Alzheimer’s and other degenerative diseases that originate with the declining power of the brain, the role of a fiber-rich diet cannot be ignored. At this point, you may be wondering how you can add more to your diet. Luckily, it’s easy to have a fiber-rich diet. Primarily, it is found in vegetables, fruits, whole grains, nuts, beans, and some other foods. However, not all of it is made equal. There are low-fiber diets and high-fiber diets. Processed foods and canned fruits and vegetables aren’t going to give you a quality amount. You should focus on adding fresh fruits and vegetables to your dishes as often as possible. Even eating a good helping of nuts for snacks could be enough to add fiber-rich amounts. Regardless of what exactly you put on your dish, it’s clear that a fiber-rich diet is a sure way to keep your brain young and healthy. It may also help you ward off Alzheimer’s and live vibrantly.